(VOXtra) - Time is running out to enter the 1st Annual Voice Arts™ Awards - a major competition honoring best-in-class performances in many genres by national and internationally acclaimed voice over artists, directors, copywriters, producers and other creative crafts within their own categories. The deadline for applications has been extended to August 31 for work that was created to be available between January 1, 2013 and June 15, 2014. 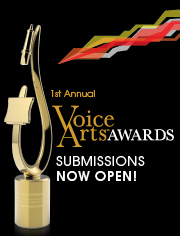 The competition is "dedicated to honoring and acknowledging all those who create and sustain excellence within the voice over industry," according to its sponsor, the Society of Voice Arts and Sciences™ (SOVAS™) - a non-profit corporation. Winners will be honored at the Voice Arts™ Awards Ceremony, an elegant event on November 9 at the Museum of the Moving Image in New York. The gala will also feature a commemorative tribute to Robin Williams and presentation of the Voice Arts™ Icon Award for Lifetime Achievement to actor/voice talent icon James Earl Jones. "Introducing a new venture like this takes time to take hold," explains SOVAS CEO/President Rudy Gaskins. "The deadline extension made it possible to reach more potential entrants. "We're seeing support from TV networks and major publishers for audiobooks," he says. "And obviously, we couldn't be more pleased by the extraordinary quality and expertise of the jurors we've amassed. They are a phenomenal group." Gaskins adds that the SOVAS board immediately decided to honor Robin Williams - the brilliant comedian, actor and voice talent - upon news of Williams' passing on August 11. "Mr. Williams was one of the first A-list celebrities to voice animated movies, further elevating the genre in Hollywood," SOVAS said in announcing the tribute. "His brilliance will be lauded by peers and fans" at the November 9 ceremony. The SOVAS executive director is Steve Ulrich, who is also executive director of the Sports and Daytime Emmy Awards and himself a five-time Emmy winner. He has also worked with voice actors across all of NBC's sports franchises, including the Olympic Games, PGA, NASCAR and NBA events. 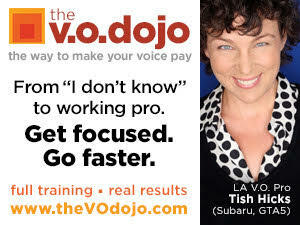 With Gaskins and Ulrich, SOVAS board members include Joan Baker - voice actor and author of Secrets of Voice-over Success; and Stephen McCarthy, former head of the Promax/BDA awards program, and now CEO/Founder of Brave Dog, specializing in award submissions for major broadcast and cable networks. For details about the awards competition and registration, please visit www.voicearts.org.